På SALT åpnes alle barene og Niilas spiller musikk i Árdna fra kl. 18. Kaldkulpene fylles også, mens hos Sørengas Badstue- og Helårsbadeanstalt og KOK er fjorden åpen for alle som tør! Sørengas Badstue- & Helårsbadeanstalt har to badstuflåter, den originale Måken bygget av drivved, og splitter nye Skarven, med plass til totalt 28 personer. På Den Store Badstuedagen kan du benytte begge og ta deg en dukkert i fjorden. NB: begge flåtene ligger på Operastranda, rett ved siden av Operaen. Det er ca. 15 min å gå langs Havnepromenaden fra SALT til Sørengas Badstue- og Helårsbadeanstalt, men takket være Åretak og Mad Goats vil noen heldige få muligheten til å bli rodd i båt eller padle over vika i kayak. On the 20th of April, SALT, KOK Oslo and Sørenga Badstue- og Helårsbadeanstalt invites all of Oslo to the Big Sauna Day 2019! With one ticket the audience can test all of Bjørvikas saunas and maybe get the best sweat of the year already this Easter! Together with Åretak and Mad Goats paddeling we’re rowing the audience who want to between the saunas. At SALT all the bars will be open and Niilas will be DJ’ing in the Árdna sauna from 6pm. The cold water barrels will also be filled, while at Sørengas Badstue- og Helårsbadeanstalt and KOK the fjord is just outside the door as always for those who dare! The day is split into four time slots: 9am-12, 12-3pm, 3pm-6pm and 6pm-9pm. The age limit at SALT is 18 years after 6pm. Check-in and purchase of drop-in tickets on the day happens at SALT. 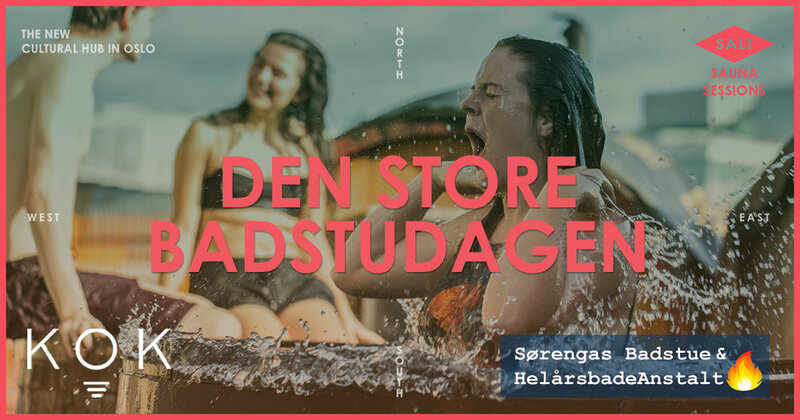 If you want to start your session at Sørengas Badstue- og Helårsbadeanstalt tickets can also be bought there (payment only via Vipps). KOK only accepts pre bought tickets. The tickets are valid for all saunas during the time slot they are bought for. Several of the saunas are small, so we can’t guarantee there’s space in all, but everyone can go between them as they want. Included in the tickets is also the rowing trip to Sørengas Badstue- og Helårsbadeanstalt with Åretak. If you want to paddel there or to KOK it costs 50nok per way or 100 for both ways with Mad Goats Paddeling (payment only via Vipps). SALT opens all its saunas for the guests at The Big Sauna Day. Both Árdna, one of the worlds largest saunas with room for 80 people, the barres sauna made by a over 100 years old aquavit barrel, the traditional Naustet sauna and SALTs newest edition right outside Árdna; a traditional sauna for up to 30 people. Outside Árdna the cold water barrels will also be filled for those who don’t want to take a swim in the ocean. By Langkaia KOK is docked whit its two sauna boats Morild and Aurora, only a one minute walk from SALT towards the Opera. Morild has been on the fjord for one year and can host 10 people, while Aurora is only a few weeks old and can host up to 14 people, and as its own bathing hatch in the floor. During The Big Sauna Day the guests can enjoy the combination of a steaming sauna and a refreshing bath in the fjord on both boats. Sørengas Badstue- & Helårsbadeanstalt has two sauna boats, the original Måken build by driftwood, and the brand new Skarven with room for 28 people in total. During The Big Sauna Day you can use them both and have a dip in the fjord. NB: both boats is located at Operastanda, right by the Opera house. That’s about 15 minutes to walk along the promenade from SALT, but thanks to Åretak and Mad Goats paddeling a few guests will have the opportunity to row and paddel over the fjord.